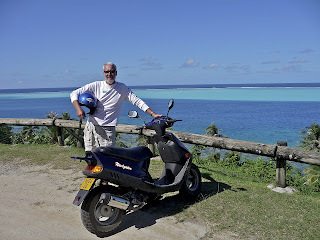 Once back in French Polynesia to resume our boat travels, we found ourselves moving slowly. First, there were boat problems, then there were new islands to explore in the Society Islands, still part of French Polynesia. I was feeling good about my French and having fun with it. We had settled into the Polynesian pace, slow and methodical. 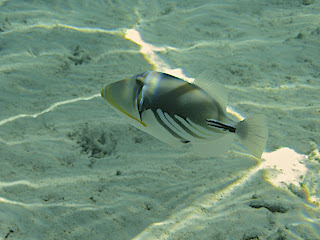 So here are a few “snapshots” from our time back in French Polynesia. Cut up a tropical fruit, grab a cold glass of something to drink, pull up a boat cushion and read on. Sometimes it takes a while to realize that a system is failing on a boat. Unbeknownst to me, Richard had been secretly worried about our batteries ever since we returned to Costa Rica and he found a set nearly dry. They lasted another season, but, upon return to Tahiti, they were once again dry. We were thrilled to be back aboard and all systems seemed to be “go”, so off we went after splashing the boat. Sure there were glitches: the outboard, already geriatric, was now not resusitatable. We bought a new one. One of the bilge pumps no longer worked. We bought a new one. There was a bit of mildew to clean up, but not much compared to Costa Rica. Everything did work, but, it turned out when we went to run an energy hog like our desalinater, the refrigerator suddenly refused to work because of low voltage. Uh, oh, that never happened before. After a few days of running around and fixing up things, we figured out the obvious. The batteries were terminal. Alas, the replacements were a bit more expensive than those in the US, but new batteries have given new life to our on-board equipment and decreased the worry factor significantly. And, I got to read up on a new system on the boat and know a lot more about electrical stuff—cruising is SO educational. Every time I’ve thought to write about our experience in various boatyards all I come up with is a song called, “The Boatyard Blues”*. Honestly, for me, I would almost rather be doing anything than boatyard work (well, shoveling poo as one of our friends did once for a job probably ranks lower). I know there are some guys (and maybe some gals) who LIKE boatyard work. For me, it’s a toxic unpleasant environment that’s a necessary evil to cruisers. Somehow, the weather always seems funky: in Seattle, when we pulled the mast to wax it and put on the storm track, it was, uncharacteristically, below freezing temperatures for nearly a week. In Mexico, Costa Rica and here in Tahiti, it’s just dang hot and humid and buggy most of the day. I wore blue bottom paint from head to toe and probably in my lungs too the first time we sanded the paint off the bottom and I didn’t think about protective equipment. The boat and we get unbelievably filthy. Our stuff fills the inside of the boat so we can barely walk let alone live aboard. We keep the boat closed up to avoid most of the dust/dirt getting inside which means it’s often 100 degrees down below. Hauling and splashing are always fraught with anxiety and twice we’ve had the boat slip off a trailer and get damaged by the fall. And then because we’re always the soft touch, there’s inevitably some sweet, mangy, pathetic dog who adopts us because we don’t throw things at him and pet him and say nice things and then wonder if we should feed him or let him continue to starve so the end comes sooner. Last, there’s inevitably some communication challenges since we’ve always been in a foreign country doing boat work, like the time we bought bottom paint, were assured it was ablative as the can said, priced like it should be, only to find that the black paint listed on the can came out red, making us wonder what was switched and where? Did we misunderstand? One day, we were blissfully out of the boatyard and med moored to the marina dock. As all good Polynesians do, we leave our flip flops on the threshold of our home—in this case, on the dock in front of our boat. Of course some of our flip flops are Keens and not the $1.99 types most commonly seen here. 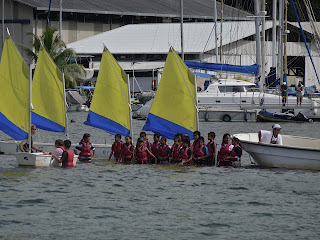 Our marina is right in front of the Ecole de Voile, the sailing school. 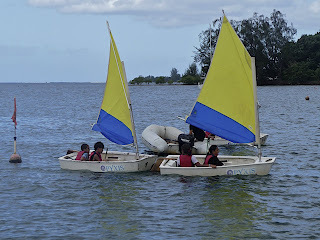 A VERY cool thing about public school here is that it is a regular part of the curriculum for 10-12 year olds, boys and girls, to spend a week of school learning to sail, read charts, navigate and reviewing boating rules of the road. So every day there were hordes of kids back and forth doing their lessons. On a day we were gone on errands, 2 pairs of flip flops disappeared from our “front porch.” Richard was devastated because his were a favorite pair of well broken in Keens that had been good for hundreds of miles (and would not be cheap to replace.) Mine were absolute bottom of the line crapola ones that I thought were good to lose—I only had 5 other pairs of sandals on the boat. Nonetheless, with my hangdog husband hounding me, I dutifully went to the sail instructor and reported our loss (in French). He told me the kids got into everything and not to leave things out, but he’d ask around for us. While I was chatting with him, I suddenly spied one of Richard’s Keens and a quick look around located the other one in the office of the sailing school—perhaps they weren’t what the kids liked after all. Well, Richard was thrilled and I was ready to let go of the other pair. But the next day after hanging out with the kids on their break and chatting about sailing, life, sharing English words with them: (They asked how do you say “cool” in English? ), a boy came running up, “Madame, Madame,” and dumped my sandals at my feet. It’s a communal type of culture so what’s ours is theirs. While in the “hotel” we stayed in while the boat was in the yard (both times), we met a nice couple who occupied the other room and with whom we shared the communal kitchen. She’s Polynesian, Hinerava, he’s French, David, and their 4 year old son, Inaho. David was there visiting his young family having developed the relationship while working in Tahiti for 4 years but being transferred back to Paris and, as it turned out, the mom and son were soon to move to Paris to join David. Hinerava was a chatterbox, quite good for my French when we first arrived, and soon shared her many misgivings about her move to France. I had the opportunity to hear the litany more than once as we ran into her a second time when we returned for our re-haul. It was a great test of my language comprehension to follow her many concerns which included the climate (understandable), the crowds/big city change, the fact that it was so impersonal, the schools so unfriendly—brick buildings instead of the open air buildings they have in Tahiti. No friends or family around. People much less friendly. And, here, to cap it off, was my favorite part of her rant—“What will we eat? There’s no good food in Paris like there is here.” Certainly, that’s the first time I’ve heard anyone express that concern on traveling to Paris. I hope she finds something edible. 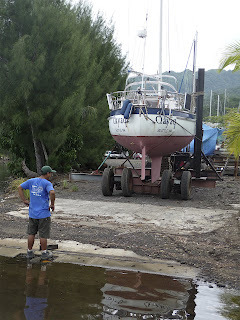 So, enough of the foreshadowing already, yes, we had to go back to the boatyard and re-haul the boat. 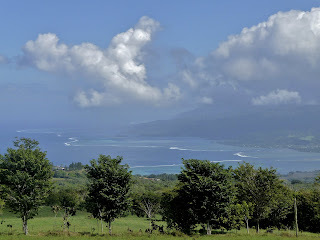 Three weeks after the initial launch (during which the boat had slipped but we were unaware of a problem at the time), we were finally at Moorea at a beautiful anchorage with clear water right near a beautiful reef for snorkeling. In we plunged into the swimming pool clear warm water. Life was good, at least until we did w hat we always do which is to survey the bottom of the boat for growth or problems. Only then did we find the big gouge on the keel all the way down to the lead which could only have happened during the launch as we had hit nothing else since being in the water. Our snorkel thereafter was a bit half-hearted as we both processed the implication of the damage. 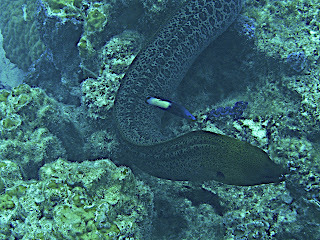 That anchorage had great snorkeling: we found a couple eels near the boat, saw tons of tropical fish, found the one and only anemone that we had seen so far in French Polynesia complete with its own little Nemo (clown fish) and one day saw the black tipped reef shark that probably had been checking us out as it cruised by, all business. Meanwhile, we communicated with our boatyard guy 50 miles away who agreed to haul us free and repair the damage. When we left the marina/boatyard, we’d had a blissful downwind sail. That meant going back was against the wind, naturally. So we slogged back in a very long day of sailing against moderate winds and exhaustedly dropped anchor. The boat was hauled last thing on a Friday of a holiday weekend—the yard closed at noon and would re-open Tuesday morning. But Yvan was good to his word and gave us access to all the equipment we needed to repair the keel and Richard did most of the repair with a little painting help from me over the next couple days. Rather than stay aboard, we went back to our little hotel which allowed us, this time, to meet our hosts. The first time we’d been at the hotel, Maithe, the hostess, and her husband, Jean Jacques, had been out cruising on their catamaran. We had communicated by e-mail initially, she left the key out for us with a detailed note about everything. When we requested to stay an extra day (left a note for the cleaning person), we got a note back from the cleaner that Maithe agreed and, when we left, we had to hunt down the neighbor at the specific house down the lane who was expecting to hold our payment for her. All very trusting and amusing and, somehow, Polynesian. When we returned, Maithe was literally at the boatyard as we hauled out, so we got a chance to meet her (even before we knew who she was) and then arranged to stay back at her place. She was worth meeting—absolutely delightful. She is so energetic and caring. The rooms had fresh hibiscus flowers every day. She brought us passionfruit, papaya juice and other sliced fruit that first morning when she learned it was our marriage anniversary. (Oh, and as an aside, I don’t recommend hauling a boat as an anniversary present for your wife.) 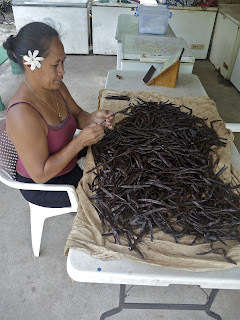 When she learned that we would finish the work a day before they could re-launch us due to the holiday, she immediately offered to take us on her own special tour of the area of Tahiti they live in, Tahiti Iti. The tour included a visit to feed the sacred fresh water eels (rather fascinating in a disgusting snake-like eel kind of way—they grow to 2 yards in length). We went to a glorious overlook up in the mountains where it was cool and we could see the island spread out in front of us like a nautical chart. When we arrived, Maithe greeted the dozen or so others up there, strangers, “Bonjour tous le monde,” hello everyone, with her cheerful manner. 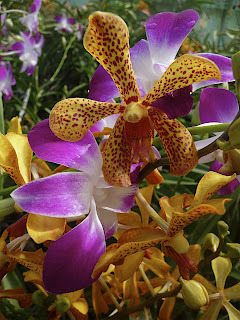 We saw an orchid farm, swam in a cool grotto above glorious waterfalls. We had taken it upon ourselves to visit the Botanical Garden—a very wonderful spot where we ran into Hinerava the second time picnicking for a little boy’s birthday party. So the re-haul visit turned out well and, by then, I felt like practically a local in the small town nearby where I went to shop almost daily. 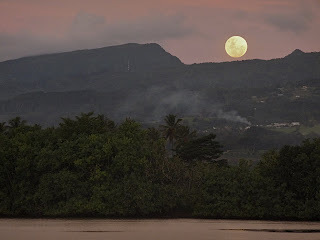 Huahine was a beautiful island. We rented a scooter to circumnavigate the whole thing in a few hours including stops at sites of interest. The scooter could not have been more uncomfortable nor, we imagine, have less power. As we headed up a long incline to the gorgeous wooded overlook, a dog started chasing us and barking. We think he had to slow down to keep from running in front of us the scooter was so slow! We found a coral garden off the island of Tahaa. 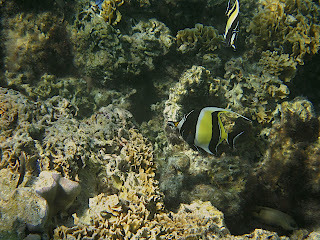 The coral was lo vely, there was a fierce current running through and the fishes were abundant and not so shy due to exposure to lots of tourists. The water was so shallow that, at times, it was possible to get into a spot where it looked like there wasn’t enough water to float over the coral. We were mesmerized—Richard was lost taking pictures and I was exploring in ecstasy. I even found an octopus swimming in the open, watched him land on a rock and change color to conform to the rock. At one point, I found myself in a tight spot and ended up scraping my thighs on the coral as I floated over. It is very hard and abrasive. 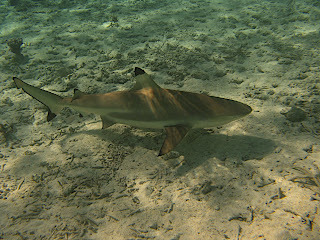 Shortly thereafter, I was thinking about whether there were any sharks in this very shallow area and, voila, right in front of me appeared a half dozen black tipped reef sharks and then a couple more, little guys, but, there I was by myself. I looked at my scraped thighs—they looked just a little red—briefly wondered if the appearance of the sharks had anything to do with the scrapes, then carried on as always, headed back to the dinghy eventually to warm up. When I checked with our other friends about the sharks, nobody else had seen any. My thighs, when I emerged from the water, were bleeding a little. Was it a shark coincidence? Perhaps not. We also stopped at a restaurant/hotel/yacht club to take a mooring ball and visit a vanilla farm. We had been assured that the mooring was free if we ate dinner at the restaurant and that the vanilla tour would also be free (or whatever the cost of whatever you bought from the farm…). Sounded good to us. We went in to check out the restaurant and look at the turtles they rescued—they ran a service for injured turtles, healing them then releasing them in the wild again. We asked to see the dinner menu. The woman running the place laughed and said, “You like fish? We have fish.” That was the menu. OK, we like fish. 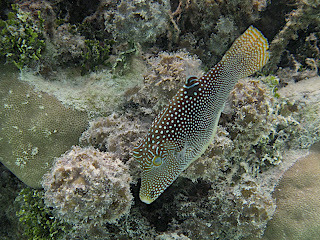 That night we had a marvelous dinner of fresh reef fish but the bill was a bit of a surprise (on the high side). So our “free” mooring and vanilla farm tour ended up costing us more in the long run. The lesson? If you have to ask the cost, you can’t afford it! Bora Bora was our last stop. We had heard that it was very touristy and we expected to want to have a very brief stay there. 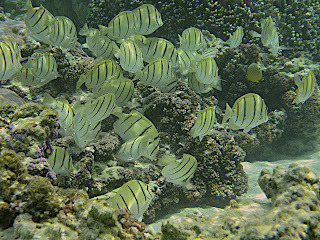 So we were pleasantly surprised when we found gorgeous shallow sandy anchorages near good snorkeling grounds in the lagoon around one of the most scenic islands in the world. 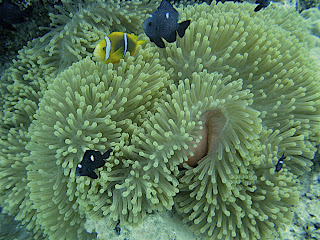 We enjoyed the island very much when we stayed in our marine environment. The day we went to shore to cut Richard’s hair, we barely lasted 5 minutes on the beach before we finished the haircut in mid-bay in the dinghy. The mosquitoes were unbelievable. 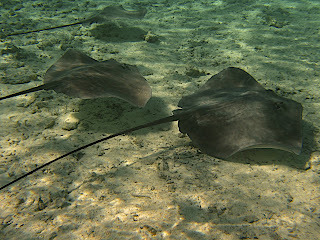 We found another place to snorkel with stingrays and sharks who are fed by tour operators. This time a bunch of us went and there were no tour boats and we had no food. The rays and sharks were well-behaved enough to swim around for a while despite the lack of food and this time Richard was armed with his underwater camera. Beautiful! So we leave soon for the Cook Islands. The “fleet” of boats sailing this area this season is now splitting up, choosing different destinations in the Cooks and we will most likely see many of them again in Tonga. Some will carry on to Fiji and eventually to Australia, some will end up in New Zealand as we hope to do. We’re headed back to work my dear. With dengue I don’t wanna be sick. And what’s coming out is red? They know what they’re doing, right? So why’s our boat a slidin’ down? That we’re gonna be their friend. Though they’re one meal from the end. Surely exposure’s gotta be bad? With our chosen paint I’m totally clad? Yeah, for sure it’s the boatyard blues.